A US publication, US News & World Report, also published its ranking of the world's top universities in June, this year. USN&WR rankings are not identical but quite similar to the Times list. Leading UK universities said institutions in Japan, South Korea and Hong Kong were "snapping at the heels" of western institutions, arguing they need more funding to compete on the global stage. However, there has been a significant fall in the number of North American universities in the top 100, from 42 in 2008 to 36 this year. The rankings are based on an international survey of 9,000 academics who assessed the institutions' research facility, teaching quality and ability to recruit staff and students abroad. "The broad message of these tables is clear - the leading UK research universities are held in high esteem internationally but countries like China and Korea, which are investing massively in their best institutions, are snapping at our heels" Wendy Piatt, director general of the Russell Group of universities said. Piatt said the UK was less well-funded than its competitors and if public spending cuts hit budgets they would be under increasing pressure. The entire Muslim world is represented by just one university from Malaysia on the top 200 list. Other Muslim nations including Indonesia, Malaysia, Iran, Pakistan, Saudi Arabia, Turkey and UAE are represented by one or more institutions among the top 400 universities listed by the Times of London for 2009. Egypt, the largest Arab nation by population, is conspicuous by its absence from this prestigious list of 400 institutions of higher learning. 1. Among the top 20 universities, including one tied ranking, there are 13 American, 5 British, 1 Australian, 1 Canadian and 1 Swiss on the list. 2. Top Canadian university is McGill in Montreal, at number 18, up from 20 last year. Australian National University and ETH Zurich (Swiss Federal Institute of Technology) are ranked at 17 and 20 respectively. Another top Canadian University in top 200, University of Toronto, is ranked 29. 3. 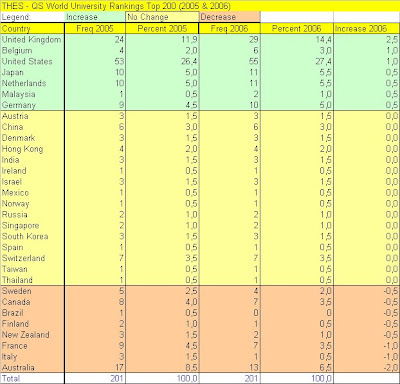 Top Asian universities are University of Tokyo at 22 (down from 19 last year), followed by University of Hong Kong at 24 (up from 26), National University of Singapore at 30, and Hong Kong University of Technology at 35 (up from 39). 4. Outside of Hong Kong, the top Chinese university is Tsinghua at 49 (up from 56), followed by Peking University at 52 (down from 50). 5. The top Irish university is Trinity College, Dublin, at 43, up from 49. 6. Two campuses of the Indian Institutes of Technology make the list, down from three in 2006. IIT Bombay is ranked 163, up from 174 last year, and IIT Delhi at 181, down from 154 last year. Beyond the top 200, there are four more Indian institutions in the top 400 list. These include IIT Kanpur at 237, IIT Madras at 284, University of Delhi at 291 and IIT Kharagpur at 335. 7. Except for UC Santa Cruz (at 252) and the relatively new campuses at Merced and Riverside (at 285), the rest of the University of California campuses are on the top 200 best universities list. UCLA is at 32, UC Berkeley 39, UC San Diego 76, UC Santa Barbara 106, UC Davis 108, and UC Irvine at 161. On a personal note, it is nice to see both of my daughters' schools, UCLA and UC Berkeley, show up among the top 50 institutions on the list. It is also a consolation to see Rutgers University, where I taught in late 1970s, ranked at 183. 8. Ranked at 181, Universiti of Malaysia is the only institution from a Muslim nation on the list, down from two in 2006. It is a sad commentary on the quality of higher education at universities in Islamic nations that renders them unable to be considered for such prestigious lists. It is not hopeless however. There are several up and coming universities in Islamic nations, including Malaysia, Indonesia, Saudi Arabia and Pakistan, which can move up the list if there is continued focus on excellence in higher education. 9. Beyond the top 200, there are thirteen more universities on the list of top 400 from Muslim nations. At 201, the University of Indonesia just missed the top 200 list. Saudi Arabia's King Saud University is at 247, Indonesia's Universitas Gadjah Mada at 250, Saudi Arabia's King Fahd University at 266, Malaysia's Universiti Kebangsaan Malaysia at 291, Malaysia's Universiti Sains Malaysia at 314, Universiti Teknologi Malaysia at 320, Universiti Putra Malaysia at 345, Pakistan's National University of Science and Technology (NUST) at 350 (up from 376), Indonesia's BANDUNG Institute of Technology at 351, Turkey's Bilkent University at 360, Iran's University of Teheran at 386 and UAE's United Arab Emirate University at 374. What do you expect. This will continue for sometime. None of the developing countries has the funds to compete with the larger one. Smaller one own their success to the bright students. Further expecting higher education and research is asking for sky from the gcc countires. The new found wealth has pushed them towards nothing but vices to the large extent being wine / women and ugly show of wealth. Donot worry those three institution of india also will be destroyed in another two to three years time as the govnerment has taken control over these autonomous insitution. Probably these corrupt politicians are paid enough to self destruct these insitutions. "The entire Muslim world is represented by just one university from Malaysia on the top 200 list. " And you still think Islam has nothing to do with it. anon: "And you still think Islam has nothing to do with it." If Islam were the problem, Muslims would never have had the greatest universities of the world in Muslim Spain, and Muslims would not have see the glory days of Science during Omayyad and Abbasid era. There would be no Alhazen or Alberuni or any of the great scientists and scholars in the Islamic world. In fact, there would have been no Renaissance in Europe that has produced the great modern universities in the top 200 in the West today. Please learn a little bit of history. It'll do you some good. Riaz: "If Islam were the problem, Muslims would never have had the greatest universities of the world in Muslim Spain, and Muslims would not have see the glory days of Science during Omayyad and Abbasid era. There would be no Alhazen or Alberuni or any of the great scientists and scholars in the Islamic world." So who do you think is responsible for the dismal current affairs. Hm, let me guess - Hindu zionists ?, America perhaps ?, Israel, India ? maraan: "So who do you think is responsible for the dismal current affairs. Hm, let me guess - Hindu zionists ?, America perhaps ?, Israel, India ?" No, it's the Muslims themselves who must share the greatest responsibility for their failures. The post-colonial Islam is consumed by anger an hatred that blinds them to their own shortcomings and distracts from the pursuit of knowledge an their historic ability to reconcile faith with reason. The situation is not entirely hopeless however. There are several up and coming universities in Islamic nations, including Malaysia, Indonesia, Saudi Arabia and Pakistan, which can move up the list if there is continued focus on excellence in higher education. Beyond the top 200, there are several universities on the list of top 400 from Muslim nations. At 201, the University of Indonesia just missed the top 200 list. Saudi Arabia's King Saud University is at 247, Indonesia's Universitas Gadjah Mada at 250, Saudi Arabia's King Fahd University at 266, Malaysia's Universiti Kebangsaan Malaysia at 291, Malaysia's Universiti Sains Malaysia at 314, Universiti Teknologi Malaysia at 320, Universiti Putra Malaysia at 345, Pakistan's National University of Science and Technology (NUST) at 350 (up from 376), Indonesia's BANDUNG Institute of Technology at 351, Turkey's Bilkent University at 360, Iran's University of Teheran at 386 and UAE's United Arab Emirate University at 374. For the first time in Indian history, over 30 top American Universities will visit India for research collaborations with Indian institutions and organizations. They will be participating in the Indo-American Education Summit on academic collaborations scheduled to be held during November 2009 in New Delhi (8th), Hyderabad (10th), and Bangalore (13th). The Summit is being organized by New Jersey based Indus Foundation, well established in the USA for over 14 years, having extensive contacts with several accredited American Universities with the mission to galvanize high-impact collaborations with reputed American Universities. "And you still think Islam has nothing to do with it." The insistence of many to blame Islam for the malaises of Muslim world is ridiculous - when real research of Islam moves from libraries and academic spheres to blogosphere and youtube under the auspices of pseudo-scholars, this is nothing surprising. In fact, the first university in Europe was in Cordoba, established by the then Emir of Cordoba(which I had the privilege to visit as a tourist). If Islam is an obstacle to freedom, to science, to economic development, how is it that Muslim society in the past was a pioneer in all three—and this when Muslims were much closer in time to the sources and inspiration of their faith than they are now? Some have posed the question in a different form—not "What has Islam done to the Muslims?" but "What have the Muslims done to Islam? "—and have answered by laying the blame on specific teachers and doctrines and groups. "The post-colonial Islam is consumed by anger an hatred that blinds them to their own shortcomings and distracts from the pursuit of knowledge an their historic ability to reconcile faith with reason"
If there is one good after effect of 9/11 and its resulting Islamophobia, it is the realization of a need for real renaissance in the Muslim world. First time since centuries, some Muslim scholars are opening the gates of Ijtihaad, which has been closed, well, sometimes in 12th century. these institutions come to india as they see money and people who intention to study for their sustenance. Pls read this article, the wealth of the western countries could be cumulative value of the highly priced labour service within the country as they have not exported labour outside. Over a period of time with people understanding the game, they are looking out for countries where they can start university to sustain their operation in their respective countries. otherwise why is the sudden love for india. They could very well go to africa for service. thanks for compiling all this info, although these types of rankings are worth about as much as "Most Livable City in America", "Most eligible Bachelor" or Pre-season College Football polls!. At least those guys get to play each other on the field and the opinion polls get continually "corrected". How can anyone take a giant diverse institution and reduce it to one number? The newspaper can choose one set of criteria, such as endowment from alumni or square feet building space per student, or number of books in the library, or leave those factors out. The rankings will completely flip-flop. A case in point. New Mexico used to rank in the top 25 engineering schools and it was quite a mystery to those of us who knew the school well why they were so high. Then overnight they dropped out! How can that happen? Well, it turns out that UNM had a contract with the Fed govt to run a national lab with a budget of hundreds of million (they just managed the money, like UC Davis does for Lawrence Livermore). That contract expired and their research $ went to almost nothing. How can a top 25 university fall completely out of the top 50 from one year to the next? It still has the same people and facilities. I have spent 30 years in higher education in the US and I know most engineering colleges first hand. If you ask me to rank them I would ask you tell me what specific area, e.g., who is doing the greatest work in fuel cells, or space robotics, or hypersonic flow, etc. Then I could identify perhaps 5-10 people who are most respected. You might find some of them in North-Central Podunk State U or you might find them at an elite private school. There are some great people in any place and some pretty unproductive ones in even the top places. It all depends on departments, labs, specific fields. To consolidate that in one number is not very meaningful. Anyway thats my 2 cents. I also dont understand the obsession about Universities in Muslim countries. Most of them dont give a damn about Pakistan. In fact, most will not even give a visa to most Pakistanis (like malaysia), yet we somehow feel kinship to them. They look down on us, particularly the Arabs, and we keep thinking that we have some special bond with them. Speaking of Malaysia, I can tell you that I have seen nothing of any value published by any researchers in that country. They are working at a primitive level. So for any place to get ranked from there tells you how flawed the system is. I think the public wants everything simplified. They dont want to take the time to look at things at a deeper level. thats what the newspapers and magazines are counting on. Thank you for your analysis and response, which I generally agree with. As a veteran of CPU benchmark wars, I am well aware of the fact that no system of benchmarking or ranking is ever perfect. But each gives you its own parameters and methodology on which it is based. And it does give you rough guidance as to the top 50 or top 100 or top 200 institutions. I believe these lists are helpful for someone in Pakistan contemplating higher education overseas in selecting the destination countries with the best universities and pick a school. For example, the Times list and the USN&WR gives you a pretty good idea that there is a better chance of getting higher quality education in US, UK, Canada or Australia. As to the reference to Muslim nations and their rankings, I haven't limited my discussion to them alone. The developing nations of India and China are also mentioned. I see these comparisons as a way to inspire and motivate Pakistanis to believe that they, too, can build good institutions of higher learning in a relatively short time if they focus and spend on higher ed, as India, China, Saudi Arabia, Malaysia and Indonesia are doing. The number of papers, citations in International peer-reviewed journal are increasing in Asia, including India, China, Indonesia and Malaysia. In particular, the nations of China, Malaysia and Indonesia are significantly ahead in terms of indicators of human development and education and productivity than our neighborhood in South Asia. Riaz: "As a veteran of CPU benchmark wars, I am well aware of the fact that no system of benchmarking or ranking is ever perfect. But each gives you its.."
it is interesting that you would equate benchmarking of chips to rating of universities! Universities are not made up of robots that follow some circuit design and programming. Jami, "it is interesting that you would equate benchmarking of chips to rating of universities! Universities are not made up of robots that follow some circuit design and programming." Benchmarking is how most things are compared in real life, from services (incl Engineering, Healthcare and Education), and manufacturing. Without benchmarks, it's hard to manage or measure the results in terms of performance and quality of any thing in real life. Most professionals, including engineers, researchers and managers depend on benchmarks to compare results and make decisions about resources, schedules, investments, and expected outcomes.Even in academia, it's often said that "you publish or perish". Harvard is ranked No. 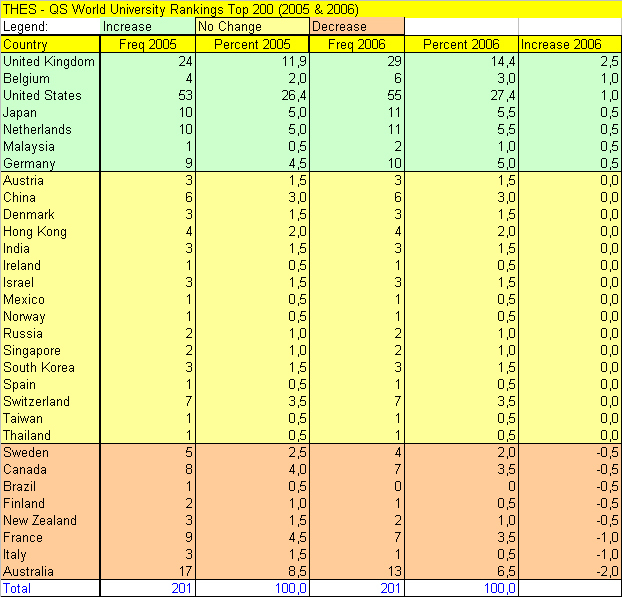 1 university in the world (every year) according to the Academic Ranking of World Universities. In terms of education, Chinese are investing heavily and significantly increasing their rankings and numbers in world's top universities relative to the rest of the world. Top Asian universities are University of Tokyo at 22 (down from 19 last year), followed by University of Hong Kong at 24 (up from 26), National University of Singapore at 30, and Hong Kong University of Technology at 35 (up from 39). Outside of Hong Kong, the top Chinese university is Tsinghua at 49 (up from 56), followed by Peking University at 52 (down from 50). There are no Indian universities in the top 100. The top Indian university is IIT Bombay at #163. A large number of Indian students are now studying at Chinese universities. Diplomats say that easy admission systems, affordable fees and high standards of facilities are the chief attractions for Indian students, who now number more than 6,000 all over China. The dominant choice of Indians is medicine. Chinese language also draws many. Clearly, Indian students are enjoying it in China. The Chinese look to the West for advanced education beyond their own borders. Forget Harvard—one of the world's best undergraduate colleges is in Iran. In 2003, administrators at Stanford University's Electrical Engineering Department were startled when a group of foreign students aced the notoriously difficult Ph.D. entrance exam, getting some of the highest scores ever. That the whiz kids weren't American wasn't odd; students from Asia and elsewhere excel in U.S. programs. The surprising thing, say Stanford administrators, is that the majority came from one country and one school: Sharif University of Science and Technology in Iran. Stanford has become a favorite destination of Sharif grads. Bruce A. Wooley, a former chair of the Electrical Engineering Department, has said that's because Sharif now has one of the best undergraduate electrical-engineering programs in the world. That's no small praise given its competition: MIT, Caltech and Stanford in the United States, Tsinghua in China and Cambridge in Britain. Iranian students from Sharif and other top schools, such as the University of Tehran and the Isfahan University of Technology, have also become major players in the international Science Olympics, taking home trophies in physics, mathematics, chemistry and robotics. As a testament to this newfound success, the Iranian city of Isfahan recently hosted the International Physics Olympiad—an honor no other Middle Eastern country has enjoyed. That's because none of Iran's neighbors can match the quality of its scholars. Never far behind, Western tech companies have also started snatching them up. Silicon Valley companies from Google to Yahoo now employ hundreds of Iranian grads, as do research institutes throughout the West. Olympiad winners are especially attractive; according to the Iranian press, up to 90 percent of them now leave the country for graduate school or work abroad. So what explains Iran's record, and that of Sharif in particular? The country suffers from many serious ills, such as chronic inflation, stagnant wages and an anemic private sector, thanks to poor economic management and a weak regulatory environment. University professors barely make ends meet—the pay is so bad some must even take second jobs as taxi drivers or petty traders. International sanctions also make life difficult, delaying the importation of scientific equipment, for example, and increasing isolation. Until recently, Iranians were banned from publishing in the journals of the Institute for Electrical and Electronics Engineers (IEEE), the industry's key international professional association. They also face the indignity of often having their visa applications refused when they try to attend conferences in the West. Yet Sharif and its ilk continue to thrive. Part of the explanation, says Mohammad Mansouri, a Sharif grad ('97) who's now a professor in New York, lies in the tendency of Iranian parents to push their kids into medicine or engineering as opposed to other fields, like law. Sharif also has an extremely rigorous selection process. Every year some 1.5 million Iranian high-school students take college-entrance exams. Of those, only about 10 percent make it to the prestigious state schools, with the top 1 percent generally choosing science and finding their way to top spots such as Sharif. "The selection process [gives] universities like Sharif the smartest, most motivated and hardworking students" in the country, Mansouri says. Sharif also boasts an excellent faculty. The university was founded in 1965 by the shah, who wanted to build a topnotch science and technology institute. The school was set up under the guidance of MIT advisers, and many of the current faculty studied in the United States (during the shah's era, Iranians made up the largest group of foreign students at U.S. schools, according to the Institute of International Education). Another secret of Sharif's success is Iran's high-school system, which places a premium on science and exposes students to subjects Americans don't encounter until college. This tradition of advanced studies extends into undergraduate programs, with Mansouri and others saying they were taught subjects in college that U.S. schools provide only to grad students. Several Sharif alumni point to one other powerful motivator. "When you live in Iran and you see all the frustrations of daily life, you dream of leaving the country, and your books and studies become a ticket to a better life," says one who asked not to be identified. "It becomes more than just studying," he says. "It becomes an obsession, where you wake up at 4 a.m. just to get in a few more hours before class." Iran's success, in other words, is also the country's tragedy: students want nothing more than to get away the moment they graduate. That's a boon for foreign universities and tech firms but a serious source of brain drain for the Islamic republic. There simply are not enough quality jobs for graduates in Iran, says Ramin Farjad Rad, another Sharif grad ('97) who's now an executive at Aquantia in Silicon Valley. What's worse, star students who stay in Iran and try to launch businesses complain that predatory government officials demand a cut of their profits or impose unnecessary obstacles. Thus many Iranians who can't make it to the West head to Dubai instead. As one Sharif grad in the Persian Gulf port city puts it, "Here, our education is properly valued. We are given freedom to succeed. In Iran, we are blocked." Such frustrations augur ill for Iran's future. True, it's produced a startling number of top students in recent years. And the country's history is rich with achievement, featuring Avicenna (also known as Ibn Sina), the medieval world's greatest scientist; Muhammad al-Khwarizmi, the ninth-century inventor of the mathematical algorithm (the basis of computer science), and Omar Khayyam, the famed mathematician and astronomer. That's a fine legacy. But unless the Islamic republic changes directions soon, all of that history and potential could be squandered.